Preheat oven to 160°C (320ºF). Place the chocolate and butter in a small saucepan over low heat and stir until melted and smooth. Place the sugar and eggs in a bowl and stir to combine. Add the chocolate mixture and stir to combine. Add the cocoa, flour and baking powder and stir to combine. Fold through the extra dark chocolate, white chocolate and nuts. Pour the mixture into a lightly greased 22cm-square cake tin lined with non-stick baking paper. Bake for 50 minutes or until cooked when tested with a skewer. * Cut into squares and serve with ice-cream. Serves 10. 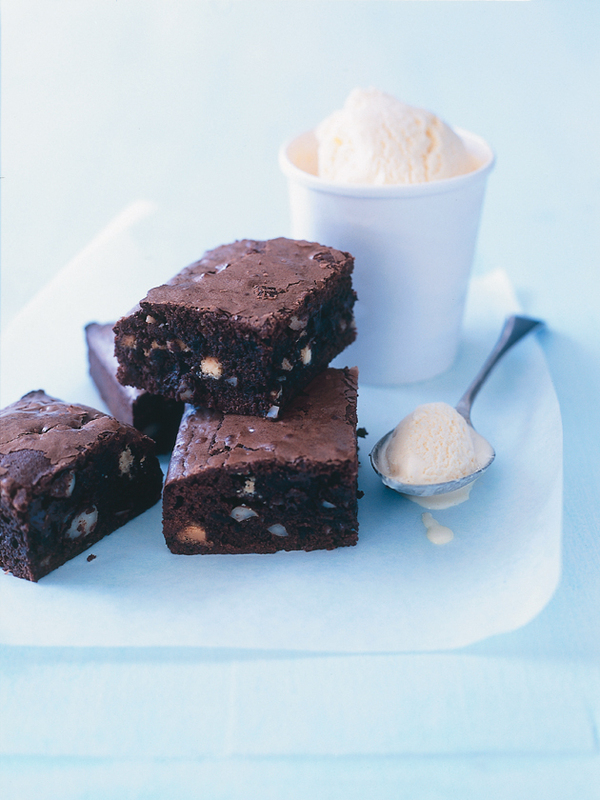 * Brownies are best served quite fudgy in the middle. To check it they are cooked, remove from the oven and insert a skewer in the centre. Remove the skewer and run your thumb and finger along it. If the mixture on the skewer is moist and forms a ball when your rub your thumb and finger together, it is ready. If you like brownies less fudgy, cook for an extra 5–10 minutes after the mixture ‘balls’ when tested. It was not the 1st time that I’ve tried a Donna Hay recipe mas it’s the 1st that I leave a comment. Yesterday I tried these extraordinary brownies to bring to work to celebrate Easter and they were a huge success! In fact, this turned in my “BROENIE RECIPE” Uau!!! Thanks, from the other side of the planet.